Immunogen: Synthetic peptide corresponding to the sequence near the N-terminus of rat angiotensin II receptor AT1. Crossreactivity: Predicted species reactivity based on epitope sequence homology: chimpanzee, bovine, rhesus macaque, sheep, dog, guinea pig, rabbit, horse, wild boar, gerbil. Predicted MW of ~41kDa. Higher MW species (~55kDa) and intermediates also observed by Western blot which reflect post-translational modification and dimerization of the receptor. Western blot analysis: MW marker (1) and 20µg of kidney membrane extract (2) probed with Angiotensin II Receptor (AT1) pAb at 3 µg/ml. 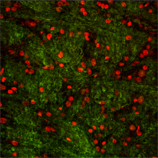 Immunohistochemistry analysis: Rat brain nucleus tractis solitarus fixed with 100% methanol and stained with propidium iodide (red) and Angiotensin II Receptor (AT1) pAb at 1:1000 (green). Cellular ELISA: HEK293 cells expressing AT1 Receptor were treated with indicated concentrations of agonist (Angiotensin II) and probed with Angiotensin II Receptor (AT1) pAb (1:1000 of a stock solution of 1µg/μL) by ELISA. Data from vehicle treated cells were taken as 100%. Results are the mean ± SEM (n=3). 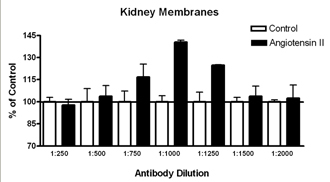 Membrane ELISA: Lewis rat kidney membranes (5 μg/well) were treated with 1 μM concentrations of agonist (Angiotensin II) and probed with Angiotensin II Receptor (AT1) pAb (1:250 to 1:2000 of a 1 μg/μL stock solution) by ELISA. Data from vehicle treated cells were taken as 100%. Results are the mean ± SEM (n=2). 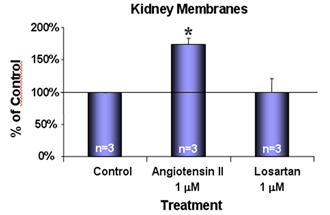 Membrane ELISA: Lewis rat kidney membranes (5µg/well) were treated with indicated concentrations of agonist (Angiotensin II) and antagonist (Losartan) and probed with Angiotensin II Receptor (AT1) pAb (1:1000 of a stock solution of 1µg/μL) by ELISA. Data from vehicle treated cells were taken as 100%. Results are the mean ± SEM (n=3).